Have you ever seen a stovetop cast iron waffle maker and wondered how it worked? I will show you! I tested two stove top waffle makers, one of which was a vintage cast iron waffle iron. The other waffle maker was made of cast aluminum. Let’s see which one worked the best and how they compare to an electric waffle maker . So let’s check out the Rome Original Cast Iron Waffle Maker and the NordicWare Cast Aluminum Belgian Waffle Maker. Watch our review here now or keep reading… or both! Why Choose a Cast Iron Waffle Maker? Before I get into the reviews, you may be wondering why you would even want a stovetop waffle maker when there are so many amazing plug-in waffle makers available. That is a great question and I had the same thought the first time I looked into stove top waffle makers. So here are a few great reasons to get one of these little devices. 1. You do not need electricity to make waffles with a stove top waffle maker! Bring one of these camping and make waffles over the fire or use it right on a grill outside- they are super portable so you can make waffles anywhere! 2. Both of the stovetop waffle irons we reviewed are very compact making them easy to store in small kitchens. No more clearing out tons of cabinet space or counter space for a bulky electric waffle maker! 3. With no electrical parts, these metal waffle irons will last you a long time- there are less part that may potentially break! With no wires or cords, you can also easily wash stove top waffle makers right in the sink with some soap and water. It’s like going back to a simpler time. If this already doesn’t sound like a waffle maker you really want, go to out Ultimate Buying Guide to see a few of 2017’s best waffle makers. 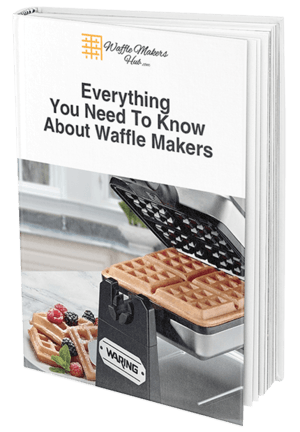 Our blog about things to consider when buying a waffle maker is also super helpful. However, if you are still all about the stove top waffle makers, then read on!! This waffle maker is small in size but super heavy because it is made completely of cast iron (just pick it up and you can tell!)! Running under $25 (check the current price on Amazon here), it is an inexpensive waffle maker which is perfect if you are buying a stove top waffle maker for the first time. While stove top waffle makers don’t have many ‘features’ per se, there are a few nice points about this waffle maker I wanted to be sure to point out. I love that the top and bottom of the waffle maker come apart which make for easy cleaning and storage. You can also separate the plates and pre-heat each one independently to save time. While the waffle iron might not have very deep squares, it is considered a Belgian cast iron waffle maker and has a nice, small checkerboard pattern. The Rome Old Fashioned Waffle Iron makes one 6 inch waffle and if you are cooking inside, you can put this waffle maker directly on your gas or electric stove. When you first get this waffle iron, be sure to follow the instructions to season it properly. The cast iron is coated in a paraffin wax to prevent it from rusting so you are going to want to go ahead and remove that before trying to make any delicious waffles! A quick clean, grease and bake in the oven and your waffle maker is ready to go (and has a 5 year warranty!). I preheated the waffle maker for 2 minutes on each side over medium heat on my gas stove and then used 1/2 a cup of our amazing waffle batter which filled this waffle maker right up. There is no drip tray or any buffer space around the waffle iron so if any batter drips over, it’s going right onto the stove (or in the fire if you are cooking outside!). I followed the directions and cooked the waffle for two minutes on the first side, flipped the waffle maker (using a towel-that handle gets hot) and cooked the waffle for another minute. Opening up the machine, I found a great looking waffle! No batter stuck to the cast iron and the waffle came out of the waffle maker cleanly. While the center of the waffle was a little more cooked, that’s probably just how my gas burner directed the heat. The waffles were not quite as crispy as other waffle makers I have used but they tasted great! Made a pretty good waffle! This stovetop Belgian waffle maker is made with non-stick cast aluminum which is significantly lighter than the cast iron waffle maker I tested (although it is still pretty much solid metal which will always be a little heavy…). For under $35 (Click here for Amazon’s current price) you get a great stovetop waffle maker that you can easily bring on your next camping trip of to make some tasty waffles over a bonfire (waffle s’mores, anyone?). With a very deep Belgian waffle checkerboard pattern, this cast aluminum waffle iron creates a Belgian waffle that will definitely hold a lot of syrup! The cast aluminum is non-stick and does not require seasoning or pan spray. Equipped with a plastic handle, you can easily open and flip this stovetop waffle maker without risk of being burned (just remember the waffle maker itself is still hot!!). There is also about 1/4 inch depression around the edge of the waffle maker which will catch any over flowing batter. Who needs a separate drip tray?! The top and bottom plates of the NordicWare Cast Aluminum waffle maker easily come apart for easy cleaning. If the waffle maker isn’t too messy, simply rub it down with a dry paper towel however you can also easily clean it with soap and water right in your sink. There’s no electrical parts that may be damaged by water with these convenient stop top waffle makers! But How Were The Waffles? I preheated both sides of the NordicWare waffle maker over my gas stove top for 2 minutes on each side. About a cup and a half of Amazing Waffle Batter filled the Belgian waffle grid and the small amount of excess batter was easily caught in the well around the edge of the waffle maker. The NordicWare Stove Top Waffle maker made some perfect looking waffles! They were crispy and cooked thoroughly- these truly rivaled some of the electric waffle makers I have tested! No seasoning required and no electricity required either! Any overflowing batter is caught in the well around the edge of the waffle maker- a built in drip tray! Unlike the Rome Original cast iron waffle maker we tested, the cast aluminum plates on the NordicWare waffle maker are coated in a PTFE non-stick coating making it not exactly chemical free. While both of the stove top waffle makers I tested worked surprisingly well, they definitely had their differences. The Rome Original Cast Iron waffle maker was a very heavy, solid waffle maker that cooked a good waffle but took a long time to season and got super hot making it hard to flip. If you are looking for a great campfire waffle maker, I would recommend the Cast Iron Rome Original Waffle Maker- it is small and sturdy and will make a delicious outdoor waffle. Check out this cool looking recipe to use in your campfire waffle maker! Yum! The NordicWare Cast Aluminum Waffle Maker made beautiful Belgian waffles, required no seasoning at all and had a nice divot to catch overflowing batter. However, the plastic handle makes me think it might melt if placed over a fire. If you are interested in a non-electric waffle maker to use at home, I suggest the NordicWare Cast Aluminum waffle iron which is easy to use and will give you a great waffle without having to plug in or store an electric waffle maker. Both of these stovetop waffle makers are fun to use and make some tasty ‘old fashioned’ waffles. Order one today and start thinking of some delicious waffle treats to make…those s’mores waffles I suggested sound like a great place to start!